Moving away from my Finnish obsession for a while, I've come back to Blighty for a bit. I've been catching up on one or two bits and pieces of TV this week that I missed while on holiday - mainly "Sherlock". 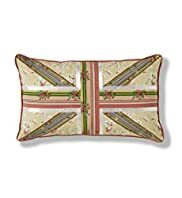 What jumped out at me last night whilst watching episode 2 was the Union Jack cushion that was propped up in one of his armchairs. Whilst also browsing through my pile of magazines detailing Autumn/Winter collection it amazed me how the Union Jack still seems to feature in so many of the collections in one form or another - and in all price ranges, whether high street or designer. I'd not seen the fridge before - that's kind of outlandish! But I love the M&S cushion, probably because it plays around with the traditional colours a bit. I could definitely find room for something like that at home.